As I said a few weeks ago, there comes a point in the middle of the winter when keeping warm becomes my primary life goal. There are many sweaters I aim to knit this winter but how can I even think straight with chattering teeth and a shivering body? In November, I cast on for the second of three sweaters (this was the first, and the third will be done soon) knit for the express purpose of staying warm. 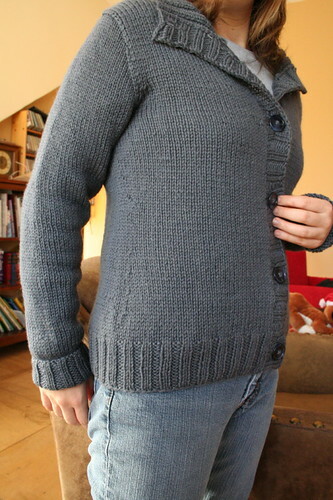 Unbelievably, I knit this in less than one week, knitting only in the evenings and during a few breaks in the day. So this is why people love to knit bulky weight sweaters! 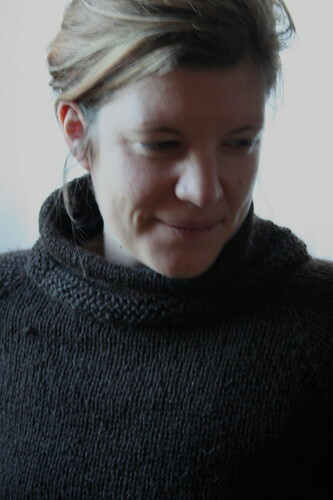 Modifications: I used long sleeves, garter stitch in place of seed stitch, a hemmed bottom edge and I used my own shaping instead of the pattern shaping. 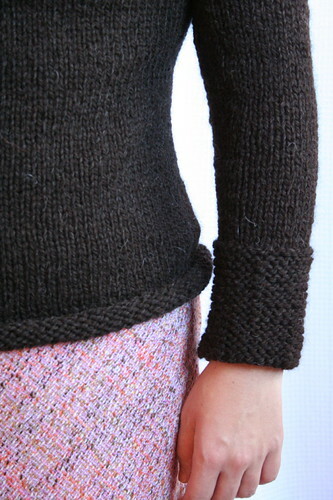 I lengthened and tapered the sleeves, ending with a long garter stitch cuff. I intended to carry this along the cowl and bottom edge; however, each time I tried a garter edge on the bottom, it looked like a large fat roll – not exactly flattering!I reknit the bottom edge at least four times before settling on the hem. Although I am not entirely happy with the hem, I must remember that the primary purpose of this sweater is to keep me warm this winter. Period. In fact, who knows if it will even make it to next winter? I rarely knit with bulky yarns because I doubt their durability. On the other hand, Cascade Eco Wool has a surprisingly tight spin so perhaps it will make it to next winter without pilling and fuzzing. 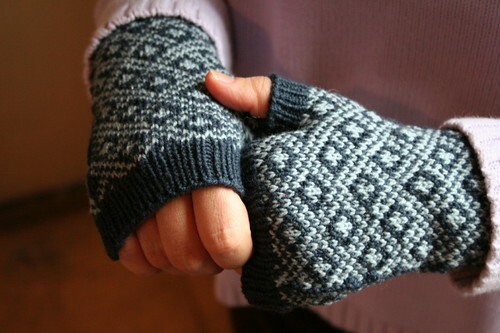 I also recently finished a pair of fingerless mitts in the same frenzy as these sweaters. Sitting at a microscope in a cold room in the middle of winter is probably one of the underlying reasons why I have felt so cold lately. I have not yet decided if these provide enough dexterity for me to do my work but I hope they will. In general, I think fingerless mitts are fairly useless when it comes to keeping one’s hands warm. Aren’t the fingers the first to feel cold? Why would anyone take the time to knit mittens that leave the fingers open? I fail to understand the appeal of the fingerless mitt. Nonetheless, I am willing to try them out in a vain attempt to warm up! In a blaze of stash busting this week, I whipped out two hats, one for my brother and the other for his girlfriend. I had almost forgotten the thrill of seeing a project to completion in less than a day. 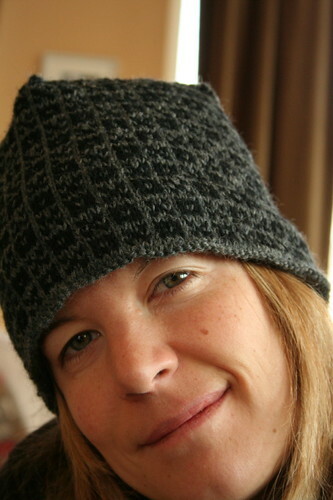 I love knitting hats! Why do I not knit hats exclusively? 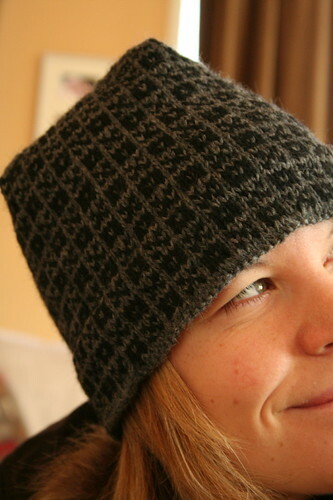 Perhaps if I wore hats myself, I would knit more of them. Still, they are so much fun to make. 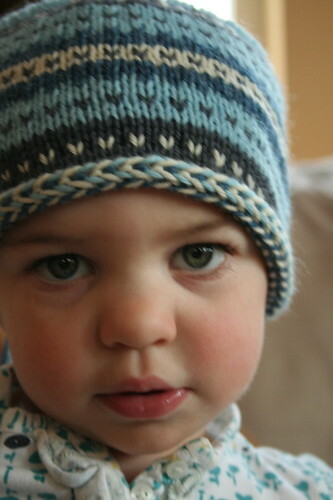 About once a year, I knit my brother a nice, warm hat in a dark color. 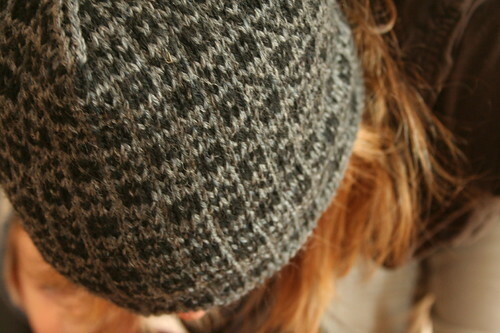 However, single-color hats are so dreadfully boring to knit! And since I only wear hats when it is really, really cold, I find hats with a single thickness of wool utterly insufficient. The only solution worth my time is, of course, a stranded project. 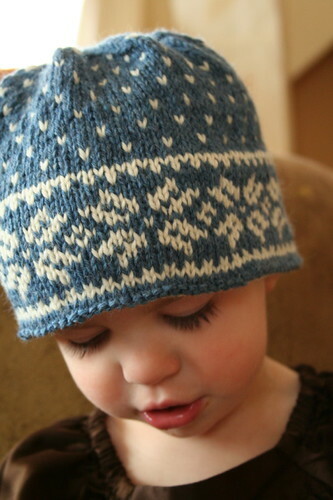 When I saw Tuulia’s beautiful Alise Mittens (Ravelry link), I decided to use a similar XOXO pattern in a hat. 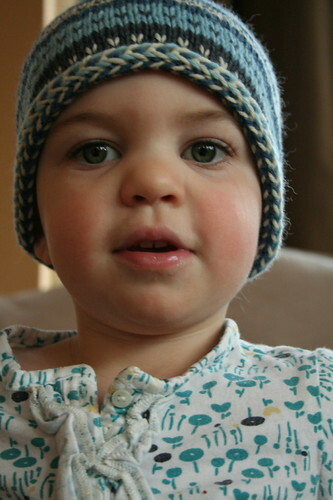 You may find a link to my free hat pattern here but really, all you need is the 8 stitch x 8 row pattern repeat and a little common sense. 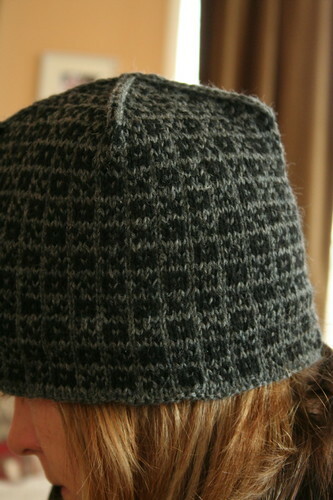 Alternating gray and black provided enough visual interest for the knitter while the overall effect is dark and subtle. 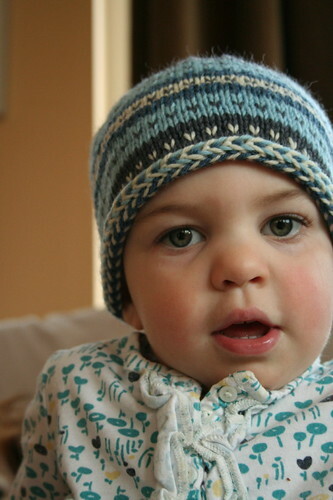 After all, my brother does not need a hat that screams, “My sister made this!” I also knit a 2.5″ lining to be tucked inside the brim for extra warmth around the ears. My scrap bag is rife with browns: coffee, taupe, chocolate, mocha, chestnut, tan, you name it, it’s brown. 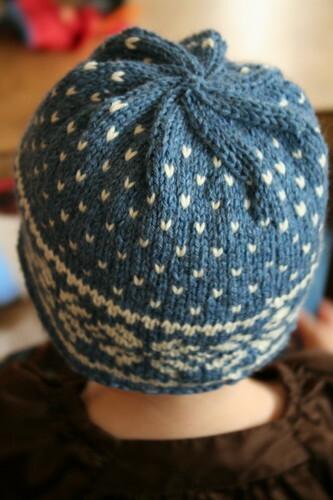 All year, I have been meaning to put my scraps to good use and knit a Chevron Love Hat by Knitterly Things’ Julia. The chevron mittens Julia made for Maritza at our October mitten swap only further convinced me: I need to knit zigzags. Finally, with the array of brown scraps in front of me, it was time. I knit this one up for my brother’s girlfriend last weekend. I could not be more pleased with the result! 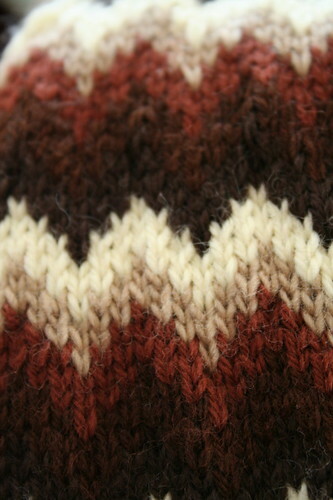 It’s a good thing I have plenty of brown left over because I see another chevron hat in my future! 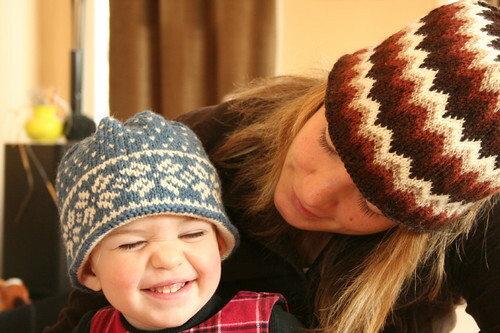 Julia’s pattern is easy and fun and the knitting flies by! I heartily recommend this one to anyone interested in using up leftovers! Yarn: a mix of Rowan Magpie Aran, Knit Picks Wool of the Andes, Top of the Lamb Lionspun, Plymouth Encore Worsted. The fiber content is not entirely pure: this hat has some acrylic blends in it. I doubt it will be much of a problem; after all, winter hats are not routinely tossed in the dryer, are they? These zigzags are my favorite! Thanks for the wonderful pattern, Julia! Well? What are you waiting for? 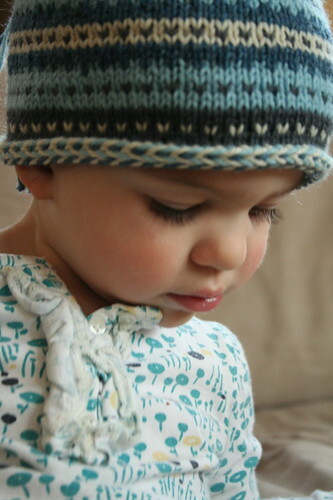 Go stash busting and knit some quick hats! My regular knitting has temporarily been placed on hold. After tripping over a bag of worsted weight wool scraps, I decided to engage in some much needed stash busting projects. I am too cheap to toss out my scraps so it appears as though there will be many striped projects in my immediate future! First up is a pattern of my own design. I had less than 100 yds of these colors so I put them together for a striped hat with an 8-point, star crown. The size shown Beatrix is modeling the 18″ version. 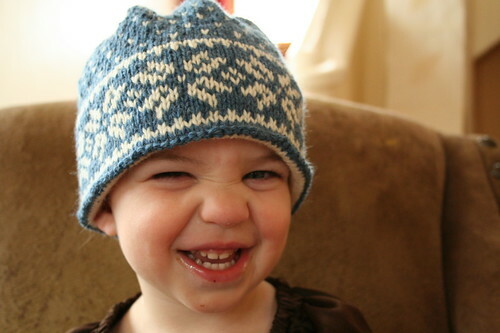 I still had a good deal of Cascade 220 left over after this hat so I used up the rest in a Norwegian-style star hat with a hidden liner, also in the 18″ size. Beatrix is pretty excited about her new hats! And there will be more to come! There’s really no reason a knitter should ever be cold, is there? And yet, I feel as if I have been frozen since August. Last month, I decided to take action. I cast on for two plain, stockinette sweaters in my battle against winter. 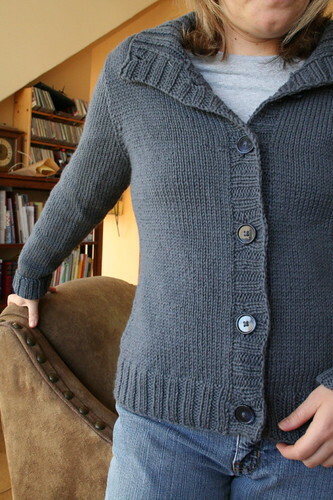 I knit this cardigan without a pattern, using Knit Picks Wool of the Andes in “Mist”, a tape measure, and a well-worn Wool of the Andes sweater as a gauge swatch. The result is utterly uninspiring. Wool of the Andes is such a mediocre yarn. The more I use it, the less I like it. I find it wildly inconsistent: some dye lots bleed profusely, some skeins are riddled with knots, and most egregious of all, I cannot make a consistent gauge from lot to lot (my gauge ranges between 18 and 20 stitches over 4″ on size 8 needles). It is the only yarn I have encountered with which I cannot make the recommended gauge every time I use it. So, you ask, what is the difference between 4.5 stitches/inch and 5 stitches/inch? 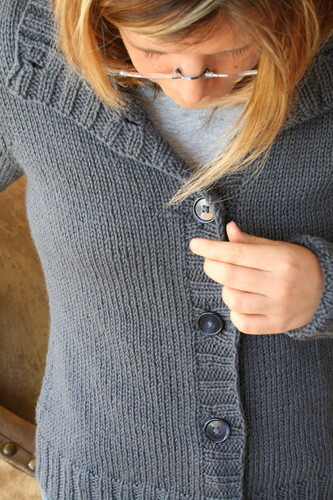 Take a look at the shoulder line of this cardigan. It falls over my shoulder. I hate that. If I did not loathe this yarn so much, I would reknit the armholes with far more rigorous shaping. However, this is a plain, simple, quick, and cheap cardigan (can you argue with $14? ), knit for warmth around the house more than anything else. My time is better served with the Skye Tweed sitting in my stash, wouldn’t you agree? The second sweater is one I started in early November, Beth Silverstein‘s Francis Revisited (Ravelry link), recently knit by Lolly and Parikha and Sarah. 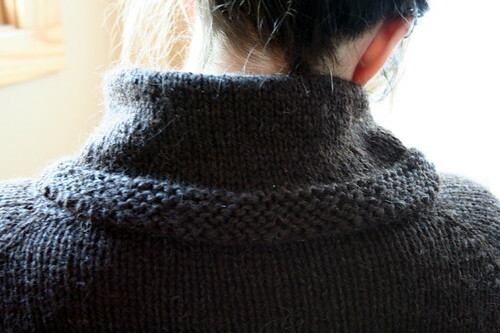 I decided to make the sleeves longer and use garter stitch in place of the seed stitch. Unfortunately, I cannot settle on a satisfactory bottom hem. At first, I knit garter stitch rows but they looked too loose and sloppy so I ripped them out. I tried again with a purl row followed by a rolled edge. 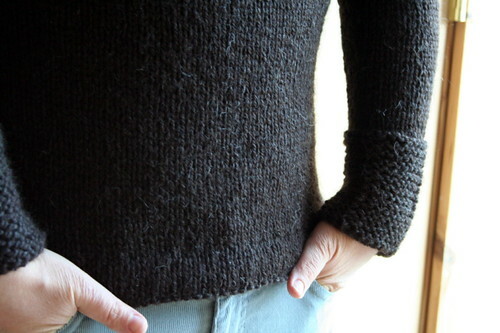 This one strikes me as awkward (and still sloppy) with the long garter stitch sleeve cuffs. Perhaps I will try garter stitch knit on smaller needles? You will see more of this next week. I am not done with it yet!